Spring is here which means lazy Sunday afternoons relaxing in the sun. Celebrate the newly arrived warmth with these fresh floral recipes. Perfect for breezy afternoons, accompany these simple, elegant dishes with a glass of rosé and great company. 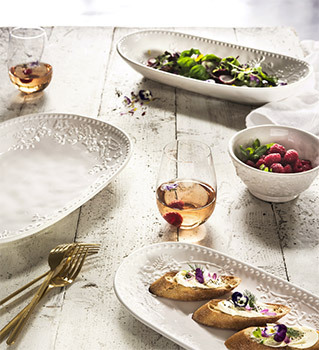 Serve these delicate recipes in our popular Euphemia Henderson range, refreshed for the season with a new all white iteration. Created in partnership with the Royal Botanic Gardens Melbourne, this range is a stunning representation of Australian botanical art and is sure to turn the simplest of recipes into a statement on the table.